Researchers have identified many reasons for the perception of chemistry as a challenging subject. General chemistry introduces more terms and concepts to students than a first-year foreign language class (Rowe, 1983). Students have struggled with the relationship between the macroscopic and sub-microscopic levels, as well as conventional, inaccessible textbooks (Taber, 2002). 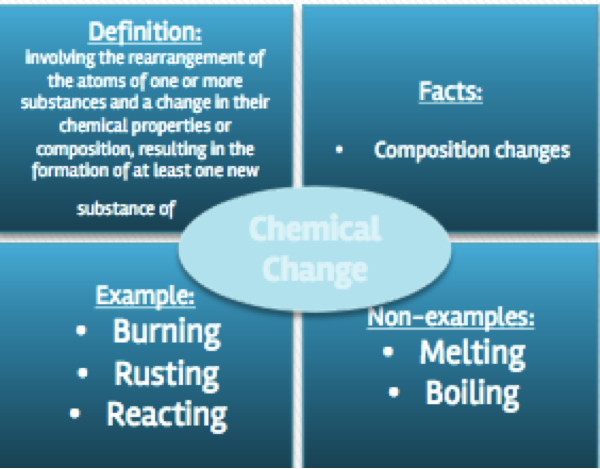 Another difficulty students have encountered is that some everyday terms take on different meanings in chemistry. For example, dispersion forces in common language implies to spread apart, but in the world of chemistry, this refers to the forces that hold particles together (Bucat, 2004). Another example of this sort of student confusion is the belief that the melting point of a substance must be a hot (high) temperature and the freezing point for the same substance must be a cold (low) temperature (Taber, 2002). Moreover, in addition to confounding words, students often have difficulty developing a macroscopic understanding of what materials with strange sounding “chemistry names” look like. Students are not often asked questions related to chemicals with which they are unfamiliar and when questioned may be unable to envision a mental picture or establish a connection (Gabel, 1999). One aspect of the organization of chemistry education that makes it more complicated is related to the structure of American high schools, where each discipline is taught in one year (Sheppard & Robbins, 2006). Children have been taught enormous amounts of content, with massive books they may not be able to comprehend, often leading to cognitive overload. Students in other countries, who learn the same content over multiple years, have outperformed students in the U.S. in science as evidenced from benchmarking studies such as the Trends in International Mathematics and Science Study [TIMSS], NCES, 2016. Johnstone (2009) suggested a total reexamination of high school chemistry because so many students have been “turned off” due to its de-contextualization and the absence of links to the real world. Further, if students can’t understand the language of the text how can they understand the content embedded in it? ...if students can’t understand the language of the text, how can they understand the content embedded in it? One way to help make chemistry more comprehensible to students is through literacy stations. The best elementary school strategy I have “borrowed” and implemented at the high school level are centers. My students generally complain about reading and writing so I took a tip from the elementary school teachers and created literacy stations to help increase the amount of reading and writing in my classroom. Literacy centers support students by arming them with the tools to utilize when examining text documents, charts, graphs, pictures etc. to take the content and make it comprehensible. Here I will provide examples of literacy centers I utilize in my classroom. Any station can be used as a stand-alone station for a one day activity. In my classroom, I have allowed students to complete any seven of the ten to twelve stations I may have for a particular unit. In the write-around station, students are presented with a large piece of blank paper or a white board. In the middle of the poster is a small picture, some phenomena for them to observe. Students have a silent conversation with each other where they pose questions, answer each other’s questions, and initiate conversation for a minimum of five minutes. Each student writes with a different color marker, and at the end of the activity the students write their name and their color marker on the back of the poster or in a key on the whiteboard. The teacher is assessing the type of questions asked, as well as the type of responses provided. It’s amazing how much students write when they’re not allowed to speak to each other. Students often draw arrows on the picture and can initiate the conversation by asking something as simple as, “What is this?” or “Why is this happening”? The write-around station can also be introduced at the end of the unit. Students are required to summarize or draw on the diagram to show understanding of a particular concept. This station has also been used to have students complete one particularly long question. For example, students write out the procedure for completing a combustion reaction for another student to complete. Figure 1 shows a picture of magic sand that students observed and reflected on during a unit on bonding that led to a conversation about molecular polarity. As a follow up to silent conversations, sometimes a picture of the poster is taken and put up on Google classroom to elicit more conversation and discussion about the comments. This station requires students to make index cards for key vocabulary in the unit. 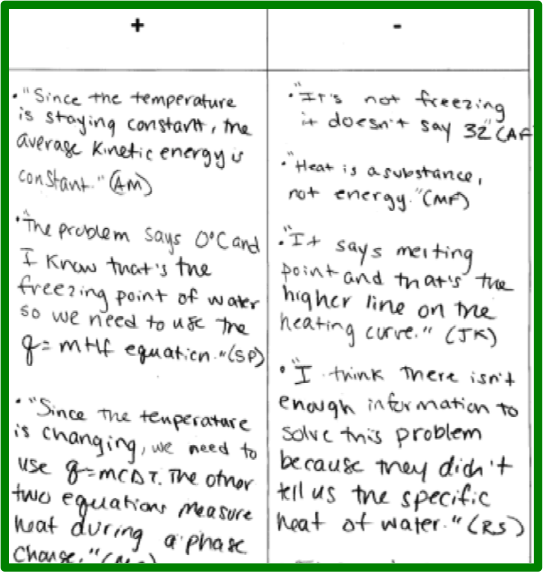 Students use large index cards and divide each card into four equal sections with the following titles for each: Definition, Facts, Example, and Non-examples. (See Figure 2.) Another option for this station would be to replace one of the sections with “Picture” requiring students to draw a particle level model. When students have completed this station, they hole punch the index cards and add a binder ring around them to serve as an assessable study guide. A couple alternatives for teachers with chrome books are to have the students create a quizlet or use vocabularly.com to practice key terms. 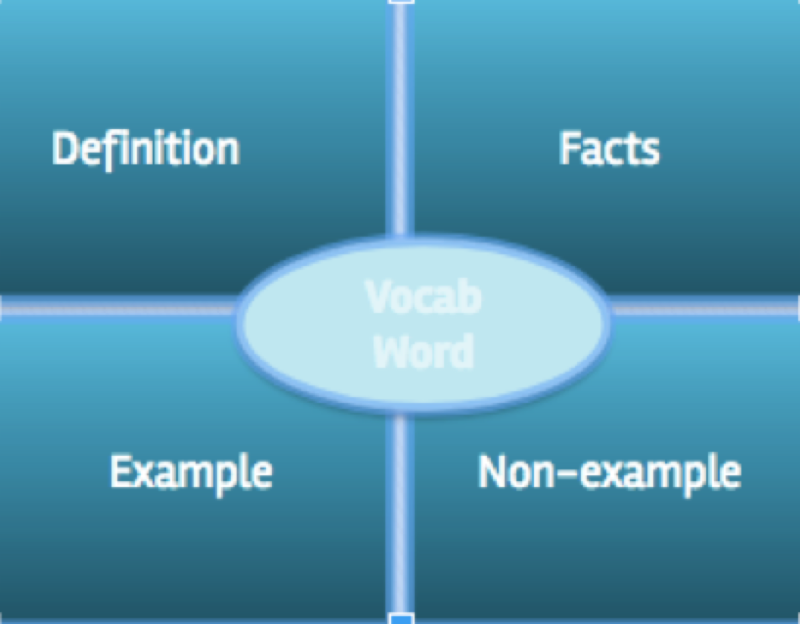 The scaffolding station breaks down the mathematical calculations in a unit by first isolating what types of vocabulary terms students will see in conjunction with certain equations (see Figure 3A). 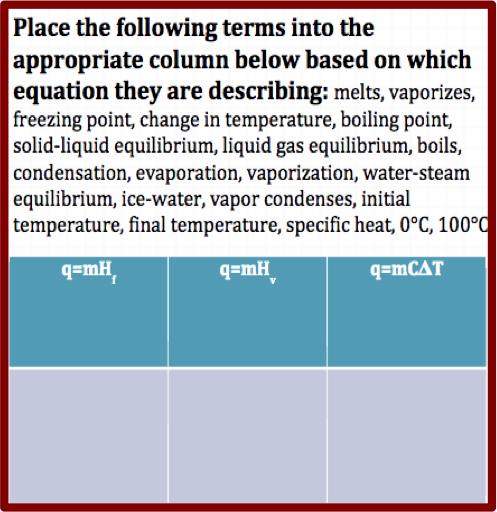 For example, when learning about various heat equations, students might struggle to identify which of the following heat equations should be used; heat of fusion, heat of vaporization or specific heat. 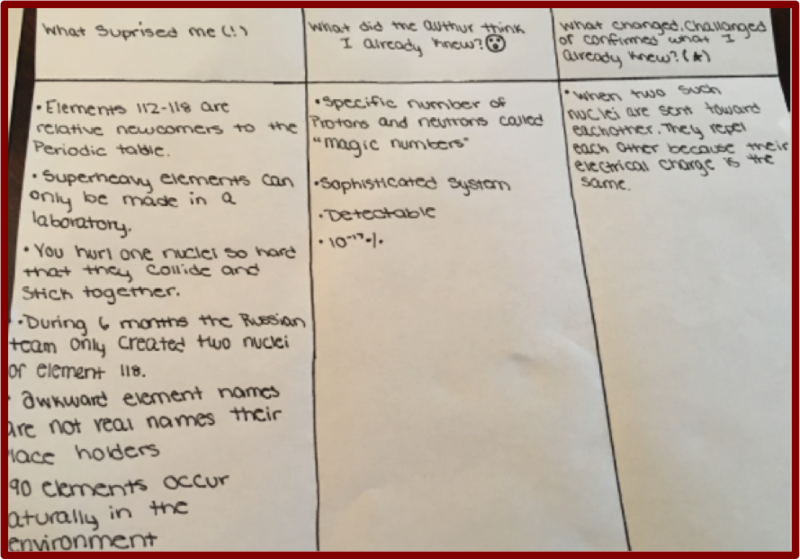 In the first part of the scaffold, students identify which key words are associated with each specific equation. Once students have gained a thorough understanding of which equation to use in different situations they are given a question using one of the equations that is scaffolded with support questions to help solve the problem. 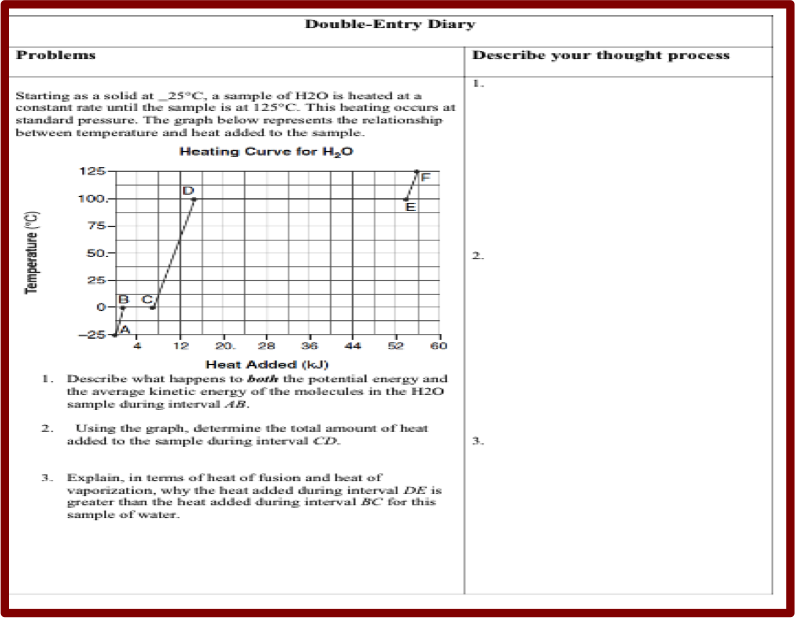 The example in Figure 3B is a “heat of fusion” question with prompts. The annotation station (Figure 4A) requires students to read the question and then write everything they are thinking about the question. Student can annotate the question as well as the answer choice, and should write any knowledge they think will assist them in answering the question or notes that would be helpful if they were trying to explain the correct answer to a friend. This allows the teacher to formatively assess student understanding. It also allows misconceptions to be explicitly identified when false conceptions are presented. Sometimes students get stuck and lack confidence because they feel they do not have a deep enough understanding to annotate adequately. 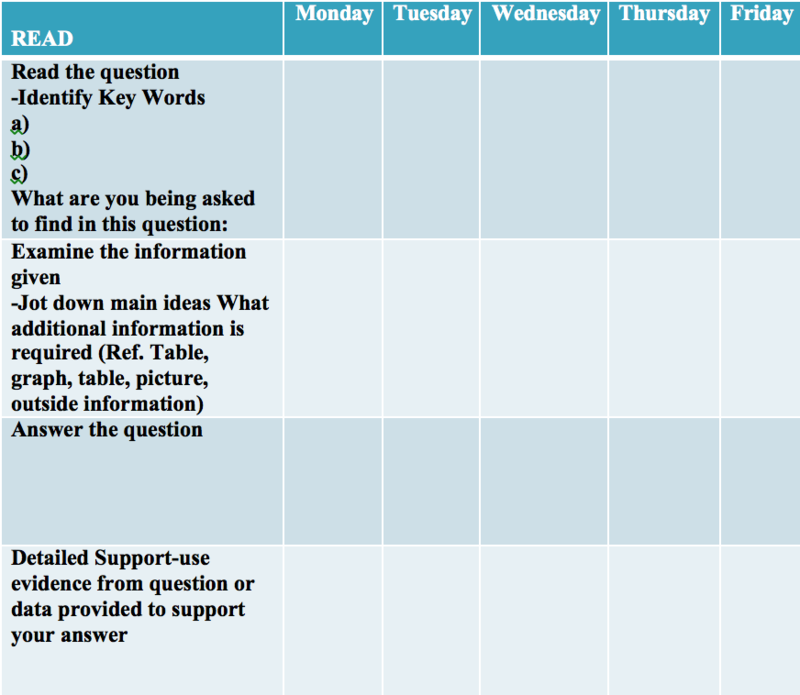 If this situation arises, a scaffold such as the one in Figure 4B, can be provided to support those students by providing additional prompts. In this station students read an article or some anchoring text. I typically require students to complete this station to ensure all students are reading about some real-life application or extension of the curriculum. Students have often been asked to read articles and summarize them in other courses. I avoid using that strategy because my students have not shown enthusiasm for completing that common assignment. Instead, I present four other options and they like these alternatives. One is the creation of a three column chart where they write: “What surprised me”, What did the author think I already knew” and “What changed, challenged or confronted what I already knew”. The example in Figure 5A is one created from a ChemMatters article (Brownlee, 2009). Alphabet Round-UP is another Text-Set option. Each student in the group is provided a sheet of paper with all the letters of the alphabet. Students spend thirty seconds trying to record as many key words from the article they can that begin with each letter. They then pass their paper and add to the words their partners listed. They continue writing and rotating this for a total of two minutes and then together identify what words are common to all the pages. After that, they write a summary of the article together. Another Text-Set option is called Gist. For this station, students read the article and write five to six words or phrases that they determine are important. Each student then describes their text to their partner. After this exchange, both students individually write a passage about the gist of the article. 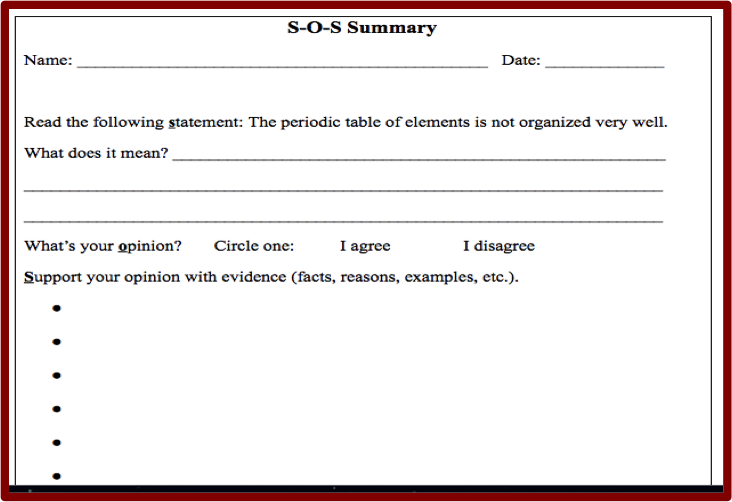 SOS stands for Statement, Opinion, Support. This Text-Set option requires the teacher to prepare a debatable statement from the assigned article. Students then circle whether they agree or disagree and support their choice with evidence from the article. This is similar to the CER (Claim, Evidence, Reasoning) for laboratory investigations. Figure 5B provides an example for a unit covering the periodic table. The Double Entry Diary station asks students to divide their notebook paper in half. On one side, they write down notes, quotes and interesting facts as they read the article. On the right-hand side they write their reaction to what they wrote on the left hand side. (See Figure 5C.) 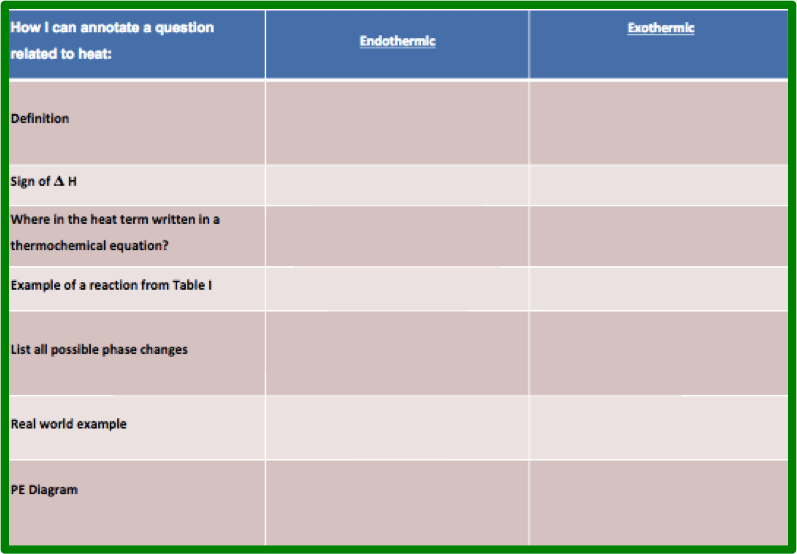 This has been adapted for multi-step questions where students are required to answer the question on the left and describe their thought process on the right column. At this station students are provided a word splash. They then need to create a concept map showing relationships between key terms. Students can complete their map on a white board or poster paper. Students are asked to first write all the vocabulary words out on post-it notes and place them near ideas they think are connected. Students then link the words together by writing sentences or phrases. Once all words are on post-its and organized on the poster or board the post-its are removed and a final map is created using markers. See Figure 6. Comic Book Station - students read and reflect on a chemistry cartoon. Another option is for the students to create their own cartoon or drawing, or to create a new panel on an existing cartoon. Animation Station - students can use Animator, Atomsmith or any other animation software to view a particle level animation and then write a reflection about what they see happening. Listening Station - In this station, students listen to a song and then answer a series of prompts about it. I typically use Michael Offut's music, but you can find other songs on the National Science Teacher Association website or with a quick search on YouTube. Simulation Center - For this station teachers provide simulations that students can choose from that address the content of the unit. Students complete questions that go along with the simulation. Sources of simulations include PhET, AACT, and VisChem. Foldable Station - Students create a foldable to summarize some aspect of the unit they are working on. This simply involves folding the paper to create a graphic organizer. For my atomic stucture unit, each student in the group is required to read a cartoon about the history of the atom and then jigsaw a discussion. At the end of the jigsaw, students collaborate to make a five-fold graphic organizer of the scientists involved in their story. Dance Station - Students create a dance or rap to show understanding of the materal learned. For additional resources about this, check out Dance Your Final, recently published on ChemEd X. Sometimes I evaluate students by walking around and making observations while the students are working on their station. I use a plus-minus chart that you can see in Figure 7A. I make note of positive behaviors I observe as well as negative behaviors. I add the initials of students in parentheses after any correct or incorrect quotes I have recorded to keep track of who is saying what and to ensure that over the course of a week, all students are provided some feedback. At the end of the class, I announce the positive content statements I heard as well as positive behavior in general. For the negative comments, I ask students to find the flaws in the incorrect quotes I recorded without identifying the students. I do check in with those students later in the week to make sure they understand why their statement was incorrect. Another strategy for assessing stations is to have students complete reflections after each activity to describe what new knowledge they added to their toolkit via the station. This can be in a written paragraph or a "3, 2, 1" style where students list three things they learned, two examples (or non-examples) and one question they still have. 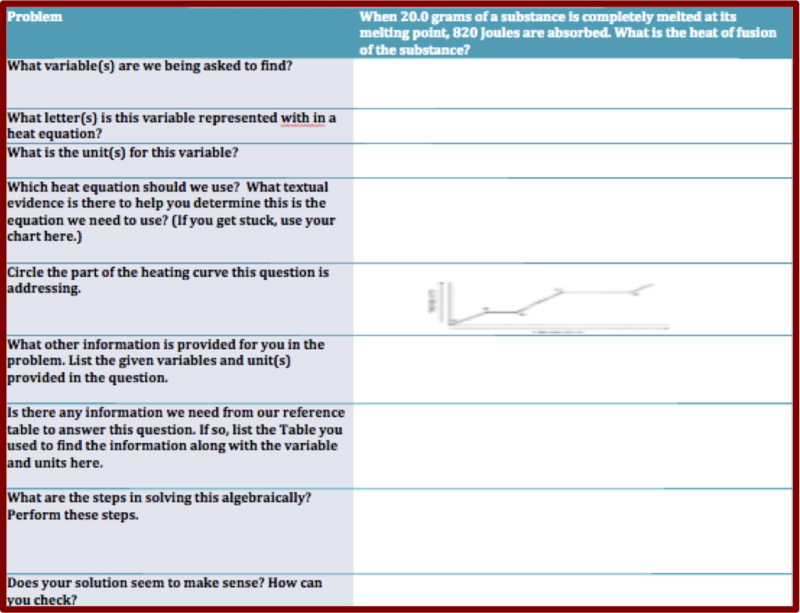 The Exit Ticket (Figure 7B) provides students with a question that they can examine through a series of prompts. This can be turned in daily. Figure 7C shows another Exit Ticket that can be turned in at the end of the week. Ben Meacham just published an article, Accepting Our Role In Developing Science Literacy, on ChemEd X that provides additional information about incorporating literacy into the chemistry classroom. Beers, G.K., & Probst, R.E. (2013). Notice & Note: Strategies for Close Reading. Brownlee, C. (2009). What Uought to Know About Elements 112-118. ChemMatters Magazine, October 2009, 9-10. Bucat, R. (2004). Pedagogical Content Knowledge as a Way Forward: Applied Research in Chemistry Education. Chemistry Education Research and Practice. 5(3), 215-228. Fisher, D., Frey, N., & Hattie, J. (2016). Visible Learning for Literacy, grades K-12: Implementing the Practices that Work Best to Accelerate Student Learning. Corwin Press. Gabel, D.L. (1999). Improving Teaching and Learning Through Chemistry Education Research: A Look to the Future. Journal of Chemical Education. 76(4), 548-554. Gillespie, R.J. (1997). Reforming the General Chemistry Textbook. Journal of Chemical Education. 74(5), 484-485. Keene, E.O., & Zimmerman, S. (1997). Mosaic of Thought: Teaching Comprehension in a Reader's Workshop. Heinemann, 361 Hanover Street, Portsmouth, NH 03801-3912. Johnstone, A.H. (2009). You Can't Get There From Here. Journal of Chemical Education. 87(1), 22-29. Kenney, J.M. (2005). Literacy Strategies for Improving Mathematics Instruction. ASCD. Rowe, M. (1983). What Can Science Educators Teach Chemists About Teaching Chemistry? A Symposium: Getting Chemistry Off the Killer Course List. Journal of Chemical Education. 60(11), 954-956. Sheppard, K., & Robbins, D.M. (2006). Chemistry, the Terminal Science? The Impact of the High School Science Order on the Development of U.S. Chemistry Education. Journal of Chemical Education, 83(11), 1617-1620. Taber, K. (2002). Chemical Misconceptions: Prevention, Diagnosis and Cure (Vol. 1). London: Royal Society of Chemistry. Tovani, C. (2004). Do I Really Have to Teach Reading? Content Comprehension, Grades 6-12. Stenhouse Publishers. Hi, I love the example of the math scaffolding station. Do you know where I could find more of these types of prompts? Thanks! I added a file for your use. Thanks! 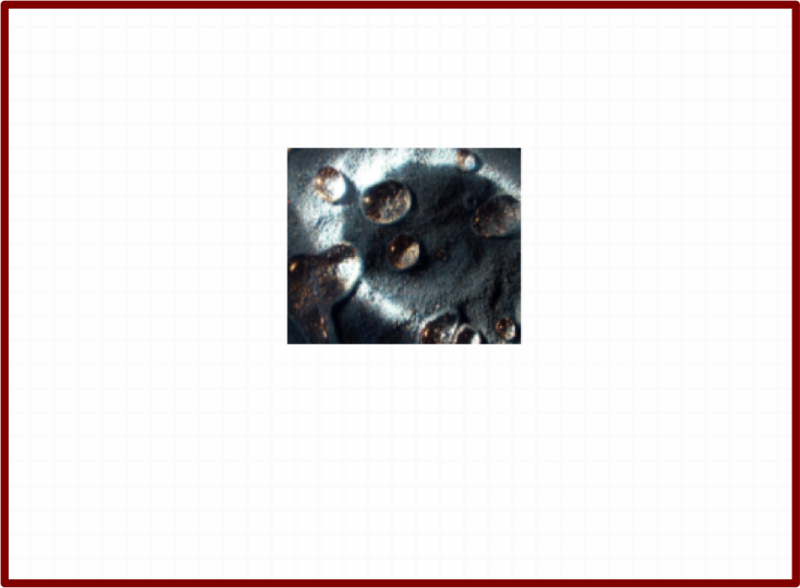 I added a thermochemistry scaffold, that contains a variety of heat problems in the supporting information. I tend to use a similar scaffold for any math problem to ensure students understand which variable is associated with each letter/symbol in an equation. Feel free to adapt and edit as you see fit. Great, Thank you! I can really see how this would benefit their thought process. Can't wait to try it out! I love your ideas. I have used some of these (Frayer Models, write-arounds, concept maps) as small group activities, but never as centers. And concept maps were difficult for my students because I don't think we did them often enough. I am curious how you structure centers-- you mention that students can do 7 of the 10-12 centers? Is this during a class period? Or do you leave them up over multiple class periods. Thanks for your thoughts--I know you posted this a while ago but I will definitely be using these. Suzanne, thanks for your comment! 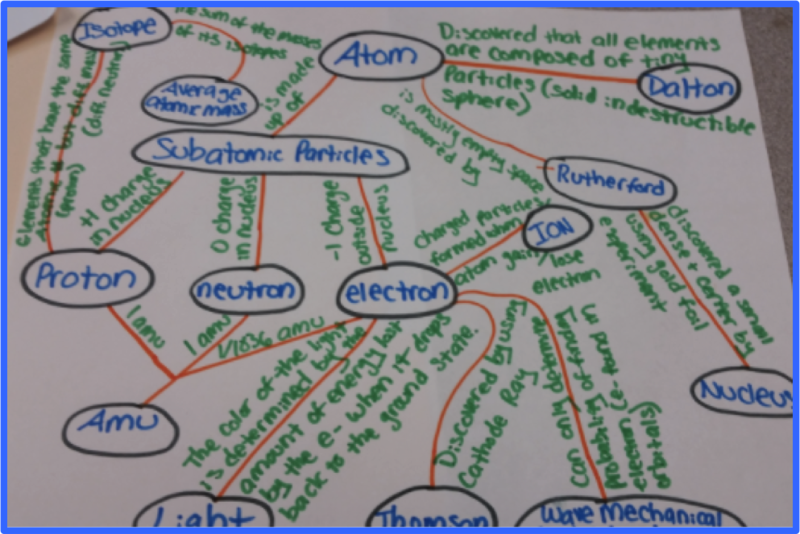 Concept maps are difficult for students, stick with it so students have time to develop these skills. My centers are generally structured over a two-week period for students to complete seven to twelve stations. I try to make sure there is a sufficient amount of time that students can process the material but not too much time that groups are not actively engaged. As I begin to plan to use this in my next unit, I have another logistics/assessment type question. I am assuming as you have students rotate, they must complete many of these stations individually. 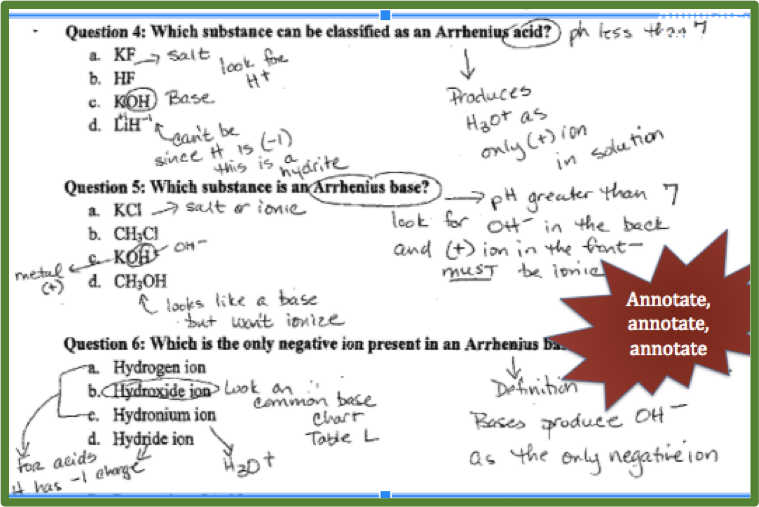 For example, with the annotation station, if I had a poster and had students annotate the questions on one big poster, some students may not participate. Also, they would not have a way to take that annotation with them to study. How logistically do your students complete the annotation station? Do they each work on their own paper? Do they annotate on a big poster and then copy on their own paper? Another question is with the Frayer Model station. Do you provide resources at this station to help students complete the Frayer Model? Or do they rely on their notes? Thanks for any help -- I think once I implement this in one unit it will be easier for me, but I need to think through the logistics and feedback process carefully. I have some students with very low literacy skills, so this will be very helpful, but only if I structure and scaffold it properly. Thanks for any help!! Suzanne, great questions! At the beginning of the unit the students are given a stations packet with all the stations and a cover sheet listing each one. For the annotation station, they have all the questions they need to annotate in the packet. They complete that station at the designated annotation station but keep thier own copy to submit when all stations are complete. You could also provide a poster per group or paper per group, for instance on the write around station for the the students to comment and take the poster when they finish so a new one is ready for the next group. Each student writes their name on the back of the poster using the color marker they wrote in so I can assess at a later time. For the Frayer station I have a class set of textbooks, 1:1 chromebooks and thier notes for support. Most kids like the ease of the internet as opposed to a textbook and use google images to draw pictures of the term if desired. I like to show students how to use the index and find features in a text since although they are not always utilized in high school, my students don't know how to use them and I find it a skill worthwhile to teach.